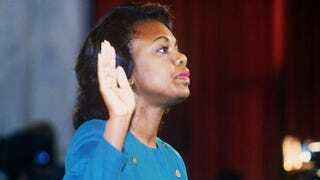 Anita Hill takes the oath Oct. 12, 1991, before the Senate Judiciary Committee in Washington, D.C.
Anita Hill addressed the Senate Judiciary Committee almost 25 years ago to call into question the character of Supreme Court nominee Clarence Thomas. Reflecting recently on the one day of testimony in October 1991 that launched her into infamy, Hill said that race had something to do with how the questioning was conducted. Although the inquiry revolved around a black woman accusing a black man of indecent behavior, Hill said last week that it was Thomas’ successful playing of the race card that shut down those who might have more aggressively questioned his capacity to sit on the highest court in the land. Kerry Washington portrays the professor and attorney in the upcoming HBO film Confirmation, which depicts the hearing. One scene in the movie features Washington and Jeffrey Wright, as Hill’s attorney Charles Ogletree, discussing Thomas’ declaration that the proceedings were analogous to a lynching. According to Hill, that’s when the committee, made up of white males seemingly scared to be clumped with Klansmen and lynch mobs, abandoned the process for fear of being considered racists. The possibility of being guilty of prejudice against a Supreme Court nominee seemingly proved a conflict for those tasked with determining Thomas’ future on the court. “We have images of black men being lynched that we all reject. It’s certainly hard for us to think we are still doing this to black men today,” Hill said, describing the racial climate of the early 1990s. But Hill felt that the committee was wrong to be blinded by accusations of a “high-tech lynching,” especially when, in this case, a black woman was accusing a black man of improper behavior. Black women have never been part of a “lynch mob,” making the Senate committee’s fears “historically inaccurate,” according to Hill. As a result of committee members’ desire to distance themselves from issues of race, Hill said that they “decided in favor of their own gender,” quite possibly relating to an unspoken idea that “powerful men are entitled” to do what they will to women. Although Hill’s accusations were made decades ago, that’s a theme that’s been repeated since, as celebrities such as R. Kelly and Bill Cosby have allegedly exerted their power over women and girls with few, if any, consequences. That sends the message that black women are “unbelievable or irrelevant,” said Hill, who noted that three other women (one portrayed by Jennifer Hudson in the TV movie) were ready to testify that they, too, had experienced harassment from Thomas but were not called. “That’s really where the real disservice happens,” she added. Instead, a panel of women were called to testify that they had not been harassed by Thomas. After being confirmed by the committee, Thomas suggested that it was time “to put these things behind us and go forward.” However, years later, the accusations are what many remember most about Thomas, a justice who rarely speaks from the bench. For Hill, the proceedings marked a turning point in her life, catapulting her into the national spotlight and transforming her into a historical icon. More important, the event brought national attention to the topic of sexual harassment and still serves as a milestone moment for those who have dealt with unwanted overtures and assault. Hill said that she received more than 25,000 letters, many of them from victims and women’s advocates who thanked her for speaking out. Her experience didn’t bring about the result she’d hoped, but Hill said that because she came forward, she inspired many others to do the same. Over the years, she’s also seen companies, universities and other institutions change their policies concerning how to deal those who come forward with allegations of assault. Now a professor at Brandeis University, where she teaches courses on gender, race, social policy and legal history, Hill hopes that her experience continues to encourage victims of assault to fight back. “I hope what people take away from it is that one person can make a change, and you are that person,” she said.